Ashlee Simspon has another hit on her hands! Her just leaked track, "Boys" is just amazing! I'm not really a big fan of her music, but this caught my eye! I wonder if she is referring to her bf, Fall Out Boy member Pete Wentz in this track. This is going to be some competition for "Outta My Head (Ay Ya Ya)" and her sis' Jessica's music! The song will be featured on her third album, ''Bittersweet World'', and this can easily be the contender for her 2nd single! Good luck Ash! CLICK HERE TO DOWNLOAD "BOYS". Here it is! The monthly recap list of all the downloads posted up here on M&M ~ Music Mania! Also, from now on I will not be uploaded files to MegaUpload, but instead to Zshare. It's quicker and people like it more. Thanks for your unterstanding. Enjoy the last MegaUpload files! **EDIT**: Added "Boys" to the end of the list, which just leaked. *Nicole Scherzinger featuring Brick & Lace ~ "Puakenikeni"
*Danity Kane ~ "2 of You"
*Good Charlotte ~ "I Don't Wanna Be In Love (Dance Floor Anthem)"
*Rihanna featuring Justin Timberlake ~ "Rehab"
*Ashanti ~ "The Way That I Love U"
*Lil' Mama featuring Chris Brown & T-Pain ~ "Shawty Get Loose"
*Enrique Iglesias featuring Lil' Wayne ~ "Push"
*Keke Palmer ~ "Friend Request"
*Madonna ~ "Keep the Trance"
*Paula Abdul ~ "Dance Like There's No Tomorrow"
*Making the Band 4 ~ "Together"
*Making the Band 4 ~ "Got Me Going"
Here it finally is! The video for Lil' Mama's newest single, "Shawty Get Loose". It features Chris Brown & T-Pain and it is off the album ''Voice of the Young People''. The single is good and video is just okay, and definatley not her best. Well that's all! Enjoy! Just 2 days we were talkin bout this and it is finally here! The US version of Leona Lewis' music video "Bleeding Love". I deeply love this song and I am one of the few Americans who like this girl. (She's from the UK, fyi) This new video is, in my opinion better than the first version. When they shot this video back last month, they had to close down all of Times Square! Hope this video makes her big here in the USA! Here's the music video for Kylie Minogue's newest single titled "In My Arms". It is no "Can't Get You Outta My Head", but it's a cool video. I like the funky, futuristic feel to it! She looked pretty good. Kylie is releasing two new singles, at the same time from her new album ''X''. We have the music video for the first one (this) and look out later today for the music video "Wow". Hope this Australian beauty does good with her new singles! **EDIT**: And here's the video for "Wow". I have one word to say and it is not "Wow", more like "Uh..". British singing star, Leona Lewis' debut, ''Spirit'', has been released in all the countries in the world, except, the most important one, The United States of America! But there is a good reason for that! Her record label is taking their sweet time because their promotion for her is gonna be huge! ''Spirit'' will be released in the US on April 8th, but promotion has already begun! This week she will premiere the US version of her first vingle, "Bleeding Love" on MTV's TRL. Also, Leona will be recording 2 more songs entitled "Misses Glass" and "Forgive Me" for the US version! Now, thats a treat for such a long wiat! Good luck to her with her new career, which I'm sure it will go sky high! British trio, Atomic Kitten has finally made a return to the music scene! The group broke up in 2004 after hit singles in Europe and internationally, but 4 years later they have once come again! I never really cared for these girls, but this song proved me wrong! Their newest single is a cover of Dionne Warwick's hit "Anyone Who Had a Heart". They recorded this track for the Number One Project event in Liverpool, UK. All proceeds from the digital downloads will go to charity. The video is OK, but their cover of the song is amazing! The video premiered on British ''GMTV'', where they were promoting the song. Rumor has it they will go in the studio later this year to record their 4th album together. Enjoy! Making the Band Update + New Songs! Wow, not just new stuff from Danity Kane today, but also new things from the untitled band from Making the Band 4! All we need left is Donnie Klang's new music and the whole crew will be set! Also another quick reminder the new season of Making the Band will premiere Monday, January 28 on MTV at 10 pm Pacific Time. First up is the girls, Danity Kane. Just a week after putting up the poll to vote for their new single the new single of the girls has been chosen! It is the track "Damaged", as we all know and loved. The final edit features Diddy's voice near the end. Its no big deal so I'm not gonna post the new version, just re-post the old version. I'm happy they chose it over "Pretty Boy". Also, their new album called ''Welcome to the Dollhouse'', will be dropping on March 18. In addition, the girls are featured on this month's issue of KING Magazine and their song new song "2 of You" will be featured on the soundtrack for Step Up 2. CLICK HERE TO DOWNLOAD "DAMAGED". CLICK HERE TO DOWNLOAD "2 OF YOU". Next is the guys turn! The group still doesn't have a name, but their new tracks are pretty good! 2 of their songs leaked called "Got Me Going" and "Together". "Got Me Going" is rumored to be their first single! Their album is supposed to be released a week before DK's on March 11th! That's good news for Diddy and Bad Boy Records! Lol. CLICK HERE TO DOWNLOAD "GOT ME GOING". CLICK HERE TO DOWNLOAD "TOGETHER". Have J.Lo & Marc Anthony Gone Arabian? Lol, no, they are still their their Hispanic selves. Disney released some pictures from a photo shoot called the Disney Dream Portrait Series to help celebrate Disney theme parks current theme, Year of a Million Dreams. A lot of celebrities have been doing these photo shoots portraying Disney characters. In the picture Marc is Aladdin, and Jennifer is Jasmine, and I must say it suits her well! Attached is a video of the photo shoot from Spanish television. Translations would be much appreciated! Enjoy the photo and video! More Idol stuff today! Season 4 winner Carrie Underwood, just premiered her latest video for her single "All American Girl" off her sophomore album ''Carnival Ride'' today! I am not a fan of her style or music, but I must say this video is quite entertaining! She is currently doing way better then all of the other Idols out there, and there is no stopping this girl now! Season 7 of AI is on every Tuesday and Wednesday at 8 PT only on FOX! Enjoy the video! American Idol judge, Paula Abdul has finally returned to the singing scene! She hasn't released new music in a very long time, mostly because of old age and taping Idol. But, she has released a new single "Dance Like There's No Tomorrow", as a part of co-judge Randy Jackson's new album ''Randy Jackson's Music Club, Volume 1''. The song actually leaked last Friday on Ryan Seacrest' Los Angeles radio show, but it was only a snippet so I decided to wait until today when the HQ version was released to publish the post. I've never really been a fan of Paula and I didn't really care about her until I heard this amazing song! It's very retro and something we all need to come back! She has another job well-done! Good luck in the future Ms. Abdul! CLICK HERE TO DOWNLOAD "DANCE LIKE THERE'S NO TOMORROW"! By now you have heard of Asia Cruise, the newest prodigy of The HiTz Committee Records. Her first single "Selfish" leaked last year and she has been working on her album for a year now. But the weird thing is the label wished to keep her identity a secret! They just posted up a picture of her black silhouette and it was called Who is Asia Cruise?. This promotion technique actually worked, kinda, lol. She revealed her identity today in her video premiere! The track wasn't that good to me at first but now I'm starting to digg it. But this Asia Cruise girl, is not what I imagined her to be, lol. I (among with may other people) thought it would be Asia Nitollano, former member of the Pussycat Dolls, who claimed her fame on their reality show. But it is just some Asian girl. I just wonder where ''Cruise'' came from? Tis video also features a part of anoher one her songs at the end I'm thinking will be called "Boyfriend". Enjoy the video! You can visit her MySpace here! A Beyonce & Tina Deut? For a while now Beyonce has been working for a follow-up to ''B'Day'', but she has one duet making the headlines! B is set to perform at the Grammy's on February 10th (which hopefully won't get cancelled because of the Writer's Strike) but today sources confirmed that at the rehearsal that the song she would be performing would be with the legendary Tina Turner! People magazine confirmed this today! So far Beyonce or Tina's reps have not confirmed anything, but you never know what they are trying to hide! This duet is going to be something truly very amazing and we will keep you posted when more information arrives! Female rapper Lil' Kim officially announced today that she has parted ways with her Record Label, Atlantic Records. She had been signed with the label her whole singing career. Rumors are already spreading she will join Capitol Music Group's independent branch, Imperial Records. She has already began working on the successor to ''The Naked Truth'', which she confirmed on TRL to come out around Valentine's Day. Now it is confirmed for a May release. I absolutely love this girl to death and I hope she will release her first single very soon! I been dressed up as her for Halloween, lmfao! Kim (Real name: Kimberly Jones) has also been confirmed to appear as a judge on Season 2 of PCD's show called The Pussycat Dolls Present: Girlicious. This season they are searching for a whole new group, instead of a new member for The Pussycat Dolls. I went to the season finale taping of that and I must say, Lil' Kim was just gorgeous! We will keep you posted for more info about the album and the show. Madonna, one of the greatest performers of all time, is still coming out with new music! A new song of hers, entitled "Keep the Trance", just leaked a matter of hours ago. No, this is not a new song for her upcoming album which features producers like Timbaland and Justin Timberlake, but it'st an unreleased track off of ''Confessions on A Dancefloor''. "Keep the Trance", is very trance and very fun. I must say the song is pretty good, but I can tell why it didn't make the cut, lol. Enjoy! CLICK HERE TO DOWNLOAD "KEEP THE TRANCE". Remember Britney's Arabian paparazzi boyfriend, Adnan Ghalib? You know, the one who traveled with her to Mexico, escorted her on countless Starbucks runs and even hit her local Rite Aid to check out home pregnancy tests? Well, apparently she doesn't. Fellow paparazzi quizzed Brit about her relationship this weekend when they caught up with her at the Millennium Dance Complex in North Hollywood, CA. When asked, "Do you have something to tell Adnan," she replied, "I don't know who that is…I've never met him before," all in her mock British accent. Granted, the two haven't been spotted together in the past few days and rumors of a restraing order against Adnan were reported by a rival agency. But Brit's maybe man has an explanation, which he conveniently posted on the Website of his photo agency: "All I can say is I have not been in contact with Britney since early Friday morning. The reason being that I have had to attend a family funeral in Santa Barbara." The photog goes on to say his phone has been off out of respect for his family members, and he hopes to get back in touch with "Miss Spears" when he gets back to town. So, whom to believe? One of Brit's split personalities or a grieving celebrity photographer? 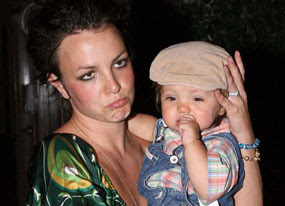 I think I'm on Team Britney, but you never know the twists of this gal's life! Disney Channel sensation, Keke Palmer is also you guessed it a singer, like most Disney alumni. Her album ''So Uncool'' was released last Summer but today some new tracks of hers were leaked onto the Internet. The one that caught my eye the most was an unreleased track called "Friend Request". The song is good enough to maybe be a single! At first I thought she was talking bout MySpace, but no I was wrong, lol. Who knows, maybe it will be on a re-release?? Enjoy! CLICK HERE TO DOWNLOAD "FRIEND REQUEST"! Here are the results to the poll from January 6th to January 20th. Q: WHAT ALBUM RELEASE ARE YOU LOOKING FORWARD TO THE MOST IN 2008? Looks like ya'll want Janet's album the most. Be sure to vote in the next poll, closing in 2 weeks. Hopefully with the growing of the site we will have many more votes next time, lol. Wow! That is the only word I'm using to describe this song. The is such a beautiful song, and Cascada is an exceptionally beautiful person! The track is called "What Do You Want From Me", and it is sure to become a huge hit just like her single "Every Time We Touch". It is very dance and something that will internationally gain success. The video is nice too. It just premiered yesterday. Check it out! Yes, yes! Another single from Sean Kingston! This time just simply titled "Kingston" after his last name. The chorus, though very repetitive, has a good feel to it and its very club. This time Sean also raps, which makes the track very interesting! This kid has made such a huge debut with singles like "Beautiful Girls" and "Take You There". Plus, he produced most of his album along with J. R. Rotem. He is going to go very far in the music business, lemme tell you that! Enjoy it! Ok, ok. This isn't really a new song, but hey it's new to me! And I got some requests to post it up on the site, also. The track is called "Push" by Enrique Iglesias featuring Lil' Wayne. I haven't really been a fan of Enrique until very recently but I gotta say, this song is amazing! It is off the album "Insomniac" and this will be the third single in America, hitting radio very soon! I think this song will be as huge as his early single "Bailamos"! Enjoy the track! CLICK HERE TO DOWNLOAD "PUSH"! The Lebanese / Colombian superstar, Shakira has been laying low after the smash singe duet, "Beautiful Liar" with Beyonce, but now the belly-dancing beauty is back! She just released the video for a track called "Hay Amores", a beautiful Spanish love song. Could this possibly be the first single off her new album out later this year? Well that isn't confirmed yet, but it is going to be featured on the soundtrack of the movie Love in the Time of Cholera. Check it out! No Baby For Lily Allen! 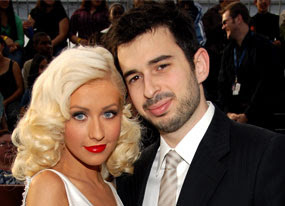 A spokesperson for the British singer announced today that Mrs. Allen has suffered a miscarriage. The "Smile" singer announced last month she was pregnant with her husband, Ed Simmons' (of The Chemical Brothers) child. "She and her partner Ed Simons will be making no further comment," the rep said. "And we ask that their privacy be respected during this difficult time." The story was first reported in London's Sun tabloid, which claimed the couple "are in a state of shock" after learning of the miscarriage following their return from vacationing. "However, as the pregnancy is at a very, very early stage," her rep said at the time, "the couple ask that you respect their privacy, as the health of Lily and their child is their paramount concern." She has been working on the follow-up to her hugely popular debut, ''Alright, Still" which has earned a Grammy nomination for Best Alternative Album. The new album is slated to be released later this year. I wish her all the best in her career and maybe a little later in life she can welcome another child. I only am posting this video to show what a one hit wonder this stupid poser is! WTF is wrong with this song, no more like this guy? Who releases a song called "Yahhh" as a single? And its not even a decent sounding song! It features Arab (Pronounced Ay-Rob) off Soulja Boy's debut album (And hopefully last) ''Souljaboytellem.com''. I'm also pissed because at the end of the video he copies Rich Boy's track ''Throw Some D's". But, this video is good for a hell of a laugh. It features people making fun of celebs like Britney Spears to Hilary Clinton. I thought Soulja was a well-rounded off artist after he released the R&B track "Soulja Girl", but I guess I was wrong. This kid really has to go back to school and as far as the recording studio as possible! Vote For Danity Kane's New Single + 2 New Songs! Until very recently, we haven't heard a lot of new music from these girls. But last night Atlantic Records put up a poll on their site to vote for DK's newest single. The two choices were were for the songs "Damaged" and "Pretty Boy". The song "Damaged" was great! I instantly fell in love with it. But "Pretty Boy" isn't really these girls best work. These songs will most probably be featured on Making the Band 4, which features Danity Kane. The show premiere's Monday January 28 @ 10 o'clock (PT) on MTV. CLICK HERE TO VOTE FOR DANITY KANE'S NEWEST SINGLE! I don't really think anyone would really like to download "Pretty Boy", so I am just going to post up "Damaged". If you wish to download "Pretty Boy", leave a comment saying so and I will provide you with the link. Janet & Mariah Album News! More news has been released today about this years top 2 R&B albums! It's all about Janet Jackson and Mariah Carey, my queens of R&B Pop! This information have been long awaited and I'm glad it's finally here! Mariah Carey's up first. It was confirmed by the L.A. Reid, the chairman of The Island Def Jam Music Group, who was previewing Mariah's new album In London. The 11th album from the superstar will be titled ''E=MC²'' and it will be out in April. Some confirmed new songs are "Bye Bye", "Migrate" (featuring T-Pain), "Touch My Body" and "I'll Be Lovin’ You Long Time". Also confirmed is that this album will be having 6 singles! Dan, I can't wait to hear 'em! Last but not least, it's Janet time! Confirmed today was the album artwork for Janet's new album ''Discipline''. The album is due later this month or in early February. The cover is in HQ for your pleasure! Enjoy! CLICK HERE TO DOWNLOAD THE FIRST SINGLE OFF ''DISCIPLINE'' CALLED "FEEDBACK". Finally after going crazy waiting for this video, it has arrived! Most of Timbo's videos, and you gotta admit it, sucked. Videos like "Apologize" and "The Way I Are" had nothing special about them and were very boring. But "Scream" is something else! It features Keri Hilson and Nicole Scherzinger of the Pussycat Dolls. This video is really his best. It is very cool, and something unlike anything else I've seen! I could easily see this video reaching #1 on iTUNES! Enjoy it! Also another quick reminder! The show where Chris Daughtry won his claim to fame, American Idol is premiering it's 7th season tonight on FOX. This season is going to be very good many critics are saying. The 2 hour season premier starts at ! Don't forget to watch it! It has been a while since the "Lipgloss" singer has been around on the music charts. Her second single "G-Slide (Tour Bus)" failed on mainstream radio and she hasn't really been around since September. But now Lil' Mama is back with her newest single "Shawty Get Loose" featuring T-Pain & Chris Brown. This song was actually released back last month but since she filmed her music video for the track yesterday I decided I would post it! And remeber, her album ''The Voice of The Young People'' will be out this spring. Enjoy the MP3! CLICK HERE TO DOWNLOAD "SHAWTY GET LOOSE". Stars + Steriods = Bad News! And no we aren't talking about baseball players! Mary J. Blige, 50 Cent, Timbaland, Wyclef Jean and filmmaker Tyler Perry are among thousands whose names have surfaced in a burgeoning steroid probe currently under way in New York. 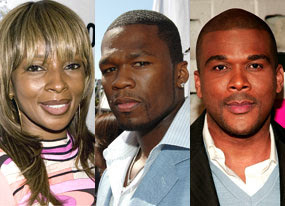 The newspaper cited medical records and testimony from several unidentified witnesses stating that Blige, Fiddy and others, in a bid to appear young and fit, received shipments of prescribed human growth hormone at hotels, production studios, health clubs and private residences, even sometimes using fictitious names. The Times Union reports the pharmacy sent supplies of the human growth hormone Jentropin and the anabolic steroid Oxandrolone to the 37-year-old Blige at the Beverly Hills Hotel, Las Vegas MGM Grand and Clay Gym. Some shipments were sent to the ''Growing Pains'' singer under the name of Marlo Stanfield, which happens to be the moniker of the drug lord in HBO's acclaimed crime drama The Wire. As for Fiddy, the report says the rap superstar received a supply of steroids mailed to his Connecticut mansion in July 2006 under the name Michael Jordan. He also allegedly received packages at his house in Los Angeles. Timbaland, whose real name is Timothy Mosley, is alleged to have obtained HGH and anabolic steroids between October 2005 and September 2006 at his Miami residence. Perry—the playwright, actor and director of box-office hits like Diary of a Mad Black Woman and Why Did I Get Married? and executive producer of the TBS comedy series House of Payne—purportedly had steroids shipped in his name to his Atlanta-based offices in 2005 and 2006. Reps for 50 Cent, Timbaland and Perry could not be immediately reached for comment, but a publicist for Blige smacked down the report. "Mary J. Blige has never taken any performance-enhancing illegal steroids," spokeswoman Karynne Tencer said in a statement. It is very unfortunate if these entertainers did do steroids because this could really hurt their careers. Wow! That's the one word to explain this new track from Ashanti called "The Way That I Love U". This song is absolutely incredible. It is as good as her hit 2004 single "Only U" and four years later she's doin it again! The song is very nice ad much much better than its predecessor, "Hey Baby (After the Club)". It going to be featured on the album ''The Declaration'' out later this year! If she keeps it up like this the album will hit platinum in no time! CLICK HERE TO DOWNLOAD "THE WAY THAT I LOVE U"! After waiting for months, finally a new music video release from Christina Aguilera! This video is for the track "Save Me From Myself" off the album ''Back to Basics''. She released it exclusively because of the birth of her first daughter, who was born Friday (See the post under this one for more information about that). The video is not "Dirrty" but it is very nice. Enjoy! This just in! There are 2 new mommies around the block! Nicole Richie and Christina Aguilera! Yup, you read it right, those 2 leading ladies just gave birth today to their daughters, at the same (well very close)! First mommy up is Christina Aguilera! Now there is a whole new meaning to her hit single, "Come on Over Baby". The five-time Grammy winner and husband Jordan Bratman welcomed their first child in Los Angeles on Friday. The couple announced the birth in a quick text message to friends and family around 4 p.m.: "Baby has arrived. Mom and dad are doing well!". There were no further details immediately available. "As soon as I have more information I will let you know," the singer's rep said. About 20 minutes later, former reality star and aspiring singer, Nicole Richie and her fiancé, Good Charlotte frontman Joel Madden, welcomed their first child together, daughter Harlow Winter Kate Madden, Friday at Los Angeles' Cedar-Sinai Medical Center, People Magazine reports. The child weighed in at 6 pounds, 7 ounces and was apparently quite healthy, as the proud parents have already left the building. "The beautiful healthy baby girl left the hospital with her ecstatic parents," a rep for the couple told People. Now I know what you are thinking about, and no, I'm not talking producing more Spederline heirs, I'm talking bout producing music! Federline, who won custody of his kids last week, has opened up an at home recording studio to produce music for fellow artists. But here's a nice catch. Its to be with his kids. How sweet! I think this just proved Kevin's being genuine and a good parent. As for rapping Kevin has let go of it. His debut album, ''Playing With Fire'' was released October 31st, 2006 (Exactly a year prior to ex-wife Britney's ''Blackout'') which sold 210,000 copies total making it a major disappoint. He did have one single though, which I hate to admit it, called "Lose Control" which was quite decent and very urban. I hope this producing career goes well, and I hope he takes good care of his kids. Or else, who knows what's next? Yes! After waiting for so long Miss-E, is back with this brand new single called "Ching-a-Ling". It is going to be featured on the soundtrack for Channing Tatum and Jenna Dewan's newest movie ''Step Up 2''. It will also be featured on Missy's new album out later this year. This song is HOT and has a very nice beat, making it an instant favorite! You can download the song below. Enjoy! CLICK HERE TO DOWNLOAD "CHING-A-LING"! After a long wait it is finally here! You know what I'm talkin' bout! Janet Jackson's newest hit single "Feedback"'s music video! This video speaks for itself! It is just AH-MA-ZING!! It is like something I have never seen before! And the dance routine. That is something very new also. Enjoy this very special video and be sure to comment and leave your 'feedback'! Lol! After being away for one year since his mega collaboration, "Break It Off" with Rihanna, Sean Paul is back with his latest single "Pepperpot". The track isn't that bad, but it is nothing like "Temperature", his 2006 hit. This is actually the second single off his album, the first being the failed single "Watch Them Roll". At first I thought this song was about drugs, lol, but no it's not. I don't really actually know what it is about. Ok, I'm really wasting my time here boring you. Enjoy the song! CLICK HERE TO DOWNLOAD "PEPPERPOT"! It seems winning American Idol is no guarantee of future success. Taylor Hicks has apparently been dropped by his label, J Records, after his first album failed to make much of a splash. "Taylor is going to record on his own for the next album," a label rep said, without offering further details. 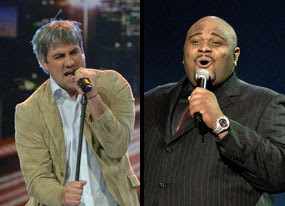 Ruben Studdard, who won the season prior to Taylor was also supposedly dropped from the record label. He is currently working on his new album, but it just won't be distributed with the label. Well technically if you heard this song when the album came out back in June it's not new to you but to the rest of the Top 40 world this is a new, very different song! The track is called "Rehab" by Rihanna and no, it isn't the "Rehab" from Amy Winehouse. This is a very uptempo, slow song featuring Justin Timberlake and produced by Timbaland, but it is sure to be hit in the coming months. I heard it on radio today and decided to post it up here for you guys. This is Rihanna's 5th single off ''Good Girl Gone Bad'' and lemme tell you, she's on a roll! CLICK HERE TO DOWNLOAD "REHAB". Finally new music from Kelly! I'm such a huge fan of this girl and I'm glad to see her comeback. The song is called "Daylight" featuring Travis McCoy from the Gym Class Heroes. Her album ''Ms. Kelly'' was a flop, but it had a very good first single called "Like This" featuring Eve. This track wasn't featured on the album but will be on the re-release out later this year. Hope you enjoy this song and I hope this makes her album huge! She needs your support! Courtesy of KeviPodMusic.com! Every week I receive an issue of Entertainment Weekly and last week's issue was all about last year's best and worst. The music section was a complete shock to me, especially the wost albums part. Take a look at the 5 worst albums of 2007 by Entertainment Weekly. 1) Soulja Boy - ''Souljaboytellem.com"
I know this is kinda late since KeviPodMusic and other blogs had this on Friday and stuff but here it is anyway, the newest leaked song from Danity Kane. You may remember them from their hit song, "Show Stopper". It hasn't been confirmed yet if this song is going to be a single or not, but I think it is pretty good! CLICK HERE TO DOWNLOAD "2 OF YOU"! Bow Wow & Omarion's collaboration album, ''Face Off'' is proving to be doing pretty well. The first single "Girlfriend" was a huge success and the album has sold pretty well. But the second single is a bit disappointing. The second single is called "Hey Baby (Jump Off)", and I thought they could have done a bit better. Well here's the video, YouTubed for your pleasure. Nicole Scherzinger. She is one of my favorite artists of all time! She became famous through The Pussycat Dolls and Eden's Crush and now she is taking a shot at a solo career. Her first two solo singles, "Whatever U Like" featuring T.I. and "Baby Love" featuring Will.i.Am both flopped on mainstream radio, though I kinda liked 'em. Now, she is releasing her 3rd single, "Puakenikeni" featuring Brick & Lace. This song is a great clubbing dance-pop track with a bit of reggae and R&B mixed in. The track is produced by the one and only Akon, and it might just be his best work yet. CLICK HERE TO DOWNLOAD "PUAKENIKENI". If you really wish to support Nicole you can always buy the song at iTUNES! Sh*t happens! ''Blackout'' singer Britney Spears was transported via ambulance to Cedars-Sinai Medical Center late Thursday after cops, paramedics, lawyers and, of course, press descended on her gated Studio City, CA home after cops responded to a "custodial dispute" that lasted roughly three hours. 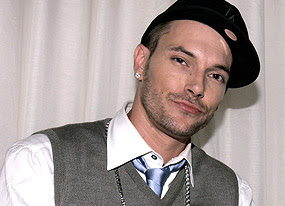 According to Us Weekly, the cavalry was called in after Spears refused to hand over tots Sean Preston and Jayden James to Kevin Federline's bodyguard, as ordered by court, at 7 p.m.
She remains hospitalized in Cedars-Sinai as of Friday morning, after being detained and "taken in for evaluation," according to LAPD spokesman Officer Jason Lee. The kids are currently with their daddy at his Tarzana, CA home.I wish her the best becuase of all this endless drama, her music career is going to result for it.